When most people think of Azul Cosmetic Surgery and Medical Spa, they think of facial cosmetic surgery. It’s with no small amount of pride that many consider Azul to be the finest cosmetic surgery practice in Florida. That said, there is far more to Azul than just cosmetic surgery. We offer lots of non-invasive cosmetic procedures that can achieve remarkable results. At our Azul Medical Spa, we offer skincare treatments that can rejuvenate your skin, improving its texture, tone and health. But is there anything we can do for you when you don’t have time to come in for a treatment? Of course! Enter our Azul SkinHealth Products. In association with Trilogy Laboratories, our Azul SkinHealth products offer you the cutting edge of skincare science. When Dr. Flaharty first started out as a cosmetic surgeon, he was unimpressed with the quality of most of the skincare products on the market. Although their marketing promises were impressive, their results rarely were. 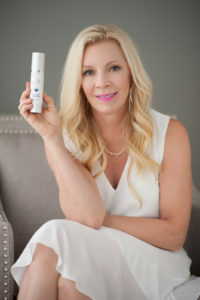 With his wife, Dr. Kristen Flaharty, they founded Trilogy Laboratories and set out to create skincare products that were equal to the Azul brand. Today, you can reap the benefits of this quest with a product package that can give you anti-aging results that you will have to see to believe: the Azul Anti-Aging System. To start off the Azul Anti-Aging System, we essentially have a microdermabrasion treatment in a jar. Azul’s Enzyme Polish is a unique mix of physical and chemical exfoliating agents that work together to dissolve the protein “glue” that holds dead skin cells together, revealing the younger, healthier skin underneath. To prevent skin dryness, the Enzyme Polish also contains aloe for the healthy hydration of your skin. And unlike some exfoliation products out there, our Enzyme Polish is suitable for all skin types. It’s an elegant and gentle formulation that can be used 1 to 3 times a week. We want to make sure that we get rid of all dead cells on your skin, so let’s double down on exfoliation with our Rejuva Gel Cleanser. Using 10% glycolic acid, this cleanser gently removes all of the leftover dead skin cells, while also helping with the absorption of the serums and moisturizers that are to come later. This cleanser’s gel formulation is perfect for normal, combination or oily skin and can be used in the morning and evening. The health benefits of vitamin C are very well known. Vitamin C is an antioxidant that strengthens collagen, provides anti-wrinkle effects, smooths skin texture, and soothes inflammation. Our Dermal C 20% is an intensive, professional-strength vitamin C skincare treatment that also incorporates amino acids and grape seed extract to help accelerate the production of collagen and elastin in the skin. It also boosts the immune system of your skin cells, to help slow down the appearance of aging. With Dermal C 20%, you can have smoother, firmer, and plumper skin, with reduced wrinkles and a visible glow. Dermal C 20% is an essential step in our Anti-Aging System and should be applied to clean skin in the morning. Retinoic acid is the gold standard when it comes to anti-aging skincare ingredients. It’s known for its ability to transform the skin, plumping wrinkles and reducing age spots, sun damage and rough skin. Not only does our Vita A Serum with Peptides use retinoic acid, it is also loaded with, take a guess, peptides! These help boost collagen and elastin production while also forming a protective barrier that prevents the formation of new wrinkles. This serum should be applied to clean skin at night so that it works while you sleep! The final step of the Azul Anti-Aging System is our Growth Factor Renewal Cream. This is our most powerful anti-aging moisturizer. It not only hydrates the skin, but also accelerates tissue repair and builds skin immunity. Growth factors supplement your skin’s health, and accelerate cellular turnover while gently re-texturizing the skin. It was developed specifically for aging, dry and sun-damaged skin, but is a fantastic moisturizing treatment for all skin types. This moisturizer can be used over the top of serums in the morning and evening! Normally, all of these products cost $340, but this month, the entire Azul Anti-Aging System is one of our biggest specials! For only $275, you will get the entire skin transformative package, but only for a few more weeks! After that, it goes back to its original price. So this is the perfect time to stock up, or to purchase the entire system as a gift for a loved one. Of course, the products in the Azul Anti-Aging System are only the tip of the iceberg as far as our skincare products go. We have everything from sun protection (stock up before summer gets here) to top-quality mineral makeup. Together with Trilogy Laboratories, Azul will continue on our path of creating exceptional skincare products to give you scientifically proven, beauty spa-level results, in the comfort of your own home. If you’d like to learn more about all of the surgical, non-surgical or medical beauty spa procedures we offer here at Azul, you can give us a call at (239) 415-7576, or visit our website at www.azulbeauty.com. If you feel like coming in for a free consultation, one of our Azul Estheticians or Master Injectors can give you some advice on how you could best use the Azul Anti-Aging System to help rejuvenate your skin at home, as well as suggest some possible non-surgical treatments to accelerate your results! Hope to see you soon! Are Soap And Cleanser The Same?